Premium natural rawhide goatskins, unbleached or machined, or treated by any chemical process. Skins are de-haired by hand sanding. 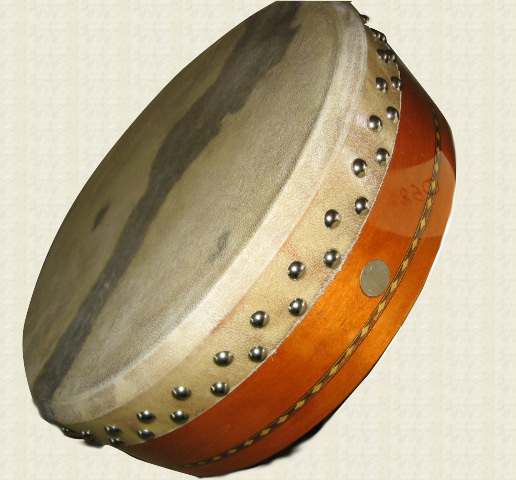 Thicknesses vary from medium to very thick depending on the player’s requirements. (Thicker skins are "punchier", last indefinitely, but take longer to break in and require more skill and strength to manipulate; thinner ones are easier to play, afford a more centered pitch and considerably less break-in period.) Heads are mounted with top quality nickel or brass plated steel tacks (not glued as with cheaper drums) allowing heads to self-adjust to the shell. We begin with 10 ply, all-maple Keller cylinders, the finest quality plywood drum-shell in the world. They'll never warp or de-laminate. Like every component in a Tambourine Studio drum, the shells are guaranteed for life for the original owner*. 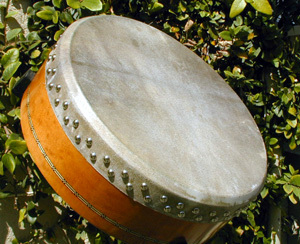 Unique among top-end drums, Tambourine Studio shells feature horizontal plys on both the outside and inside and are much less vulnerable to dirt or liquids. Simply the hardest, most stable bodhrán frame made today. Featuring custom inlay detail and an imbedded antique coin, the all-maple shells are toned with premium aniline dyes, and then finished with 8 hand brushed coats of Epifane high gloss spar vanish, the best marine varnish on the market. Developed for extreme marine weather conditions, aifane finishn Ep will never yellow, flake, or separate like polyurethane will over time, and is impervious to most solvents, oil, alcohol and hand lotions and sunscreens (which can attack a lacquer finish). A gloss finish is strongly recommended because of its superior hardness and maximum resistance to wear and abrasion and ease of cleaning, but semi-gloss, matte or rubbed oil finishes are available on request. 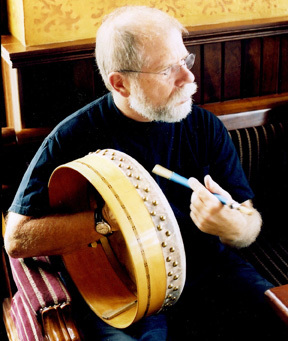 The tone and projection qualities of tunable bodhrán depends on the integrity of the head bearing, or tuning ring. Tambourine Studio offers two head bearing options: a solid brass ring, or a unique finger joint & lathe construction hardwood ring made exclusively for us by Pete Stanbridge in Newfoundland. Both rings feature precision machined bearing edges allowing the head to flow smoothly over the ring, and a 45º interior cut away allowing the head to vibrate efficiently without buzzing even at very low tension. The Stanbridge bearing is feather-light, yet incredibly strong, perfectly flat and round. The brass affords incredible sustain and volume. Either ring provides the stable, rigid platform required for real projection and resonance, far superior to the common lightweight plywood or acrylic bearing found in most other bodhráns. The tuning rings are adjusted with the minimum necessary number of continuously variable carbon steel set screws, carefully tapped through solid brass hex blocks. The hex blocks are anchored to the shell with hidden exterior machine screws. This type of construction actually reinforces the shell instead of weakening it. This fail-safe tuning system isolates all the head's energy from the resonator shell at the tuning ring. The head tension and impact are supported by the brass components, not the plywood.